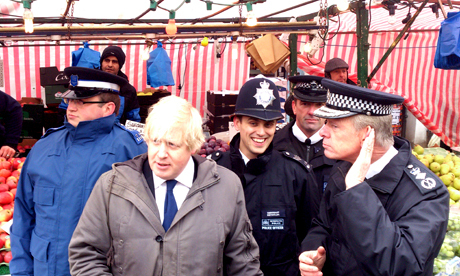 Fresh from an ill-fated television interview over the weekend, London Mayor Boris Johnson took to the streets of Hackney yesterday to launch his final Police and Crime Plan for the capital. Accompanied by members of the Dalston Safer Neighbourhood Team (SNT), Mr Johnson and Met Commissioner Sir Bernard Hogan-Howe talked to shop owners and members of the public on Kingsland Road before meeting stallholders at Ridley Road Market. However, it wasn’t long before Mr Johnson was asked about his widely reported interview with the BBC’s Eddie Mair, in which he had been questioned vigorously over past controversies. Despite Mr Mair describing him as “a nasty piece of work”, Mr Johnson said: “He was perfectly within his rights to have a bash at me – in fact it would have been shocking if he hadn’t. If a BBC presenter can’t attack a nasty Tory politician, what is the world coming to? On the issue of the policing plan and whether it was a positive thing for London, Mr Johnson said: “The policing plan that we’re launching today is intended to make better use of the entire resources available to us to get police out on the streets. Under the plans – which set out neighbourhood policing and crime prevention strategies for the next four years – officer numbers in the borough will be at 685 by 2015 (down from 770 in 2010). With the central police station on Lower Clapton Road due to close, Hackney will be served by a 24/7 front counter at Stoke Newington Police Station, one non 24-hour front counter in Shoreditch and five additional contact points in civic buildings such as libraries and hospitals. When the overall plan is implemented – which includes a total of 63 front office closures – it is projected £60m will be saved, which the Met said will be used to balance their budget and protect frontline policing. “People listened to the case we were making and they understand that it’s better to have police officers on the beat than to have inanimate buildings that can’t arrest anybody or deter crime,” said Mr Johnson. According to a police statement, the plan “will put more officers on the streets, drive down crime and make policing more efficient by reforming the Met and boosting safer neighbourhood teams”. Officer numbers in London are set to remain at around 32,000 and the Met has guaranteed that every victim of crime will get a personal visit from the police should they want one.